I did not get any house projects done today. I scheduled today’s day off (as well as tomorrow) to spend with the family. Plus, it is too hot to do anything. We did try to weed the garden a bit this afternoon, but gave up after cooking in the sun for a few minutes. This morning we took a quick boat trip. Again, no sailing (all under motor). We motored up to almost the place where we had anchored previously. It was low tide, so I was a bit nervous about running aground. I shouldn’t have worried, the boat has a very shallow draft (around 2-feet). We were able to anchor a very short distance from the shore (close enough to have the boat sit in the shade). The water was shallow enough that the boys could stand next to the boat. 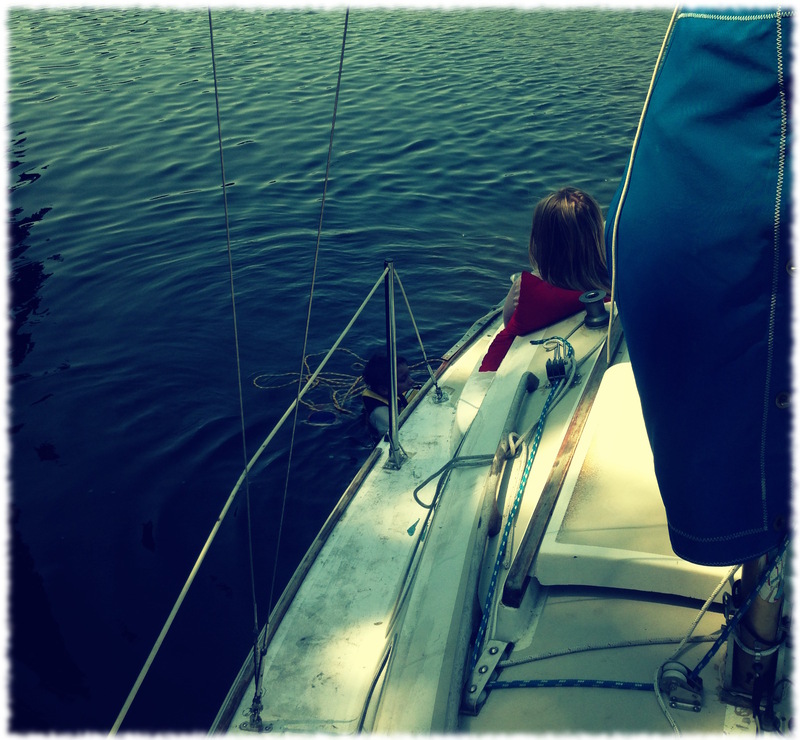 It was shallow enough for me to walk out and move the anchor when the boat drifted too close to shore. Next time I’ll have to bring my water shoes – walking to shore on the rocks is tough on the feet. We hadn’t brought lunch, so we headed home after swimming for only 30 minutes or so. The plans tomorrow were going to be to go to Six Flags. However, it is forecast to be nearly 100-degrees up at Six Flags tomorrow. That is way too hot to be enjoyable. Maybe we will decide to go sailing in the morning and bring lunch. After sailing for a half-dozen trips, I have a mental list of winter projects for the boat. They include a much better ladder, some drink/cup holders, shade for the cockpit, and a way to organize the lines in the cockpit. However nice it is to dream about a bigger boat (it is an ADHD thing to always want something different) – I think we will stick with the same boat for another season or more. ← A cool afternoon swim.